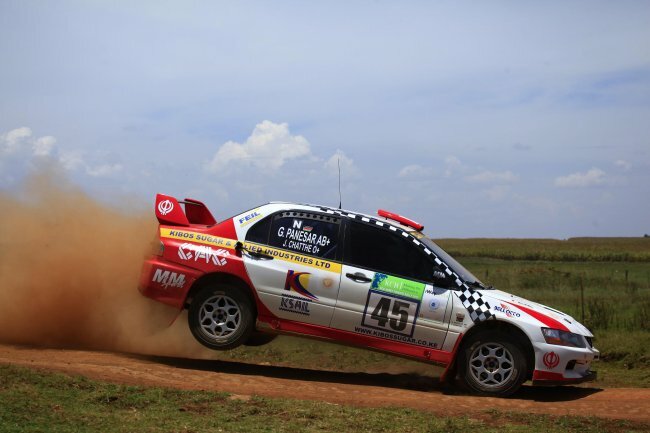 African rally champion Jaspreet "Jassi" Chatthe has taken the overnight lead of the 64th KCB Safari Rally after wrapping up his day two run with a 21 seconds cushion over speedster Rajbir Rai. With several top drivers failing to master the dusty and the demanding volcanic ash soil terrain in Elementaita and Soysambu, Chatthe who is also last year's Safari winner and defending Kenya National Rally champion, had his campaign effectively sewn up when Rajbir ran into electrical gremlins on the day's 2km super special at the Lodge. After leading for the rally for better part of the day, Rajbir had to contend with playing second fiddle to Chatthe after losing over 10 minutes into the final control due to electrical problem which cost him two minutes in penalty loss. "We encountered an elctrical problem with the fuel pump system which cost us dearly but we managed to get it sorted well in time for the last leg tomorrow," said Rajbir. Chatthe was all smiles after checking into the day's last service at Elementaita Lodge. “We have tried to keep the car clean by driving sensibly with no risks of damaging tires or suspensions on the rocky stretches. We would to do the same tomorrow to keep our dreams on the right track with the help of our Almighty,’’ said Chatthe. Third was Finland's Tapio Laukkanen who despite picking up three punctures closed the gap to lie third overall ahead of Carl Tundo and Ian Duncan. Chatthe's navigator Gugu Panesar said being first on the road slowed them quite abit in places they encountered wildlife. "Its been a good day. The stages were good. But it became rougher as the event wore on," said Panesar. Day two which is the event's longest run claimed over 10 cars including opening day leader Baldev Chager, Quentin Mitchell with a broken shock and Issa Amwari with gearbox faikure. Youngster Karan Patel went off on CS2 and was unable to continue after he got stuck on the bush. Other cassualties were Tejveer Rai with a punctured radiator, Pietro Cannibio, Izhar Mirza (electrical), John Nganga, Jonathan Somen, Jansher Sandhu, Rehan Shah, Sammy Nyorri with a broken windscreen, McRae Kimathi and Moez Malik.